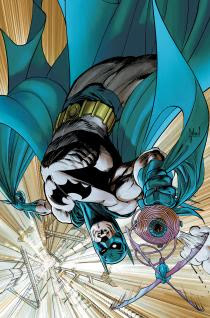 Mini-reviews and ratings of comics released March 6, 2013. Agree or disagree? Let me know by hitting me up on Twitter or Google+. Hurwitz continues to flesh out the Mad Hatter origin story. 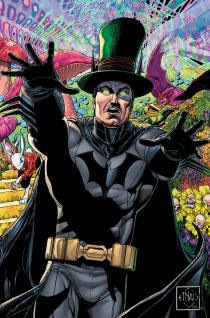 I hate the Mad Hatter as a Batman villain. So one of The Penguin's henchman has engineered a crime empire coup. 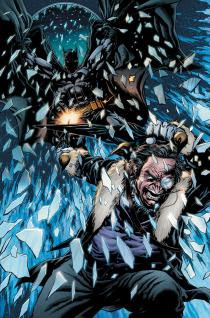 The first story of The Batman chasing down crooks we've seen before. The second story is about The Batman fighting a dragon. The ending was somewhat predictable as far as what villain was involved. The final story is about a strange new villain who doesn't speak but makes people disappear inside his vintage van. I feel my pull list getting lighter by the minute. I was about to just give up and resign myself to the fact that nothing in my list this week was going to make me happy. Fortunately, GA #18 came to the rescue. 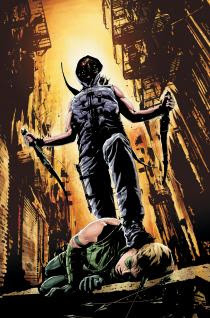 A continuation from last issue's reset of Oliver Queen, we get a few more peeks into the mysteries surrounding Arrow's new nemesis (Komodo), new maybe ally (Magus) and his father's past. It's enough to be tantalizing while still providing enough action and story to keep things moving along. I'm still on the fence as far as the art goes, though. 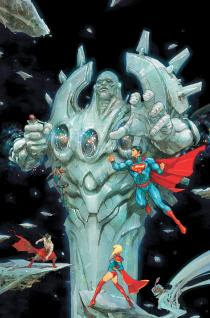 The conclusion of the H'el on Earth arc. Some questions remained unanswered. Such as, why was H'el so much more powerful than Kal El with such different powers? Based on the epilogue, it's possible that we'll find that out some day. The art was beautiful as is always the case with Rocafort. Faces are full of expression and alien designs are detailed and interesting. Even the often duplicated scene of Superman carrying the body of Supergirl was done in a way that didn't induce any eye-rolling on my part. Scott Lobdell's stories might keep me around, but I'll definitely follow Kenneth to whatever his next project is since it looks like Aaron Kuder will be taking over as artist starting with issue 20. Bucky has put his moping on the back burner and he's a man on a mission. Literally. More spy intrigue with everyone quite sure that everyone else isn't quite telling the whole story. 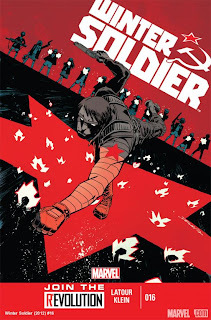 It's more of what I enjoy about Winter Soldier. The down side is the art. I see what they are going for, but it just doesn't work for me here. We're finally past the origin story and starting into a new arc. While there is very little Jack/Shadowman, there is plenty for old-time fans of the original 1990's character to squeal over. Enter Dr. Mirage (now a female) and Baron Samedi. Throw in Master Darque and a new unknown player and one gets the feeling that this roller coaster is being pulled up a very tall hill. Seems like I may have been getting worried for nothing. 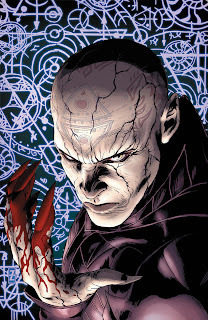 We see the beginnings of the "White Event" and the creation of Starbrand. While light on action, the storytelling is pretty good and the art is excellent. Recognizing the Starbrand symbol, but unable to place it, I did a quick search online. We're seeing the incorporation of New Universe characters, Nightmask and Star Brand, into the main (616) Marvel universe. I never read much of the New Universe line, but mixing characters from different "realities" always has the potential for something interesting to happen. I'm intrigued. 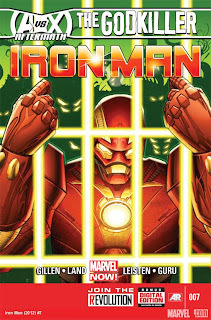 Tony Stark is imprisoned and on trial for his part in killing the Phoenix. 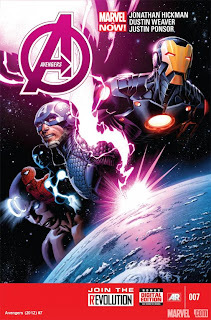 A sentient robot offers him a chance to escape, but the plan involves Stark invoking an ancient right that allows him to fight a person for each crime while his new friend retrieves his Iron Man suit/armor. There's a nice cliff-hanger ending wherein we see that, tired of Tony beating amateur fighters, they have hired Death's Head to fight on their behalf. Thoroughly enjoying this arc and Greg Land's art is even growing on me. At least it's not pulling me out of the story. Just when I thought I'd heard everything, the evil villain Massacre hatches a plot to destroy the reputation of a soft-drink company by wearing their logo and going on a killing spree. All for the measly sum of twelve-million dollars. 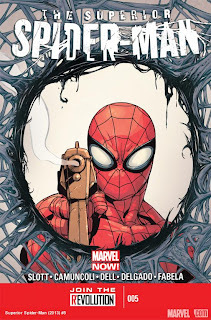 Spidey-Ock proves that in every way he is the superior Spider-Man, captures Massacre and, to all appearances, kills him so he will never be a threat again. The final page seems to indicate that Spidey has gone into Judge Dredd mode by acting as judge, jury and executioner. This title hasn't missed yet.